The TH-50PX600 is the flagship screen in Panasonic's new range of ninth-generation plasma glass. It comes hot on the heels of the 42in TH-42PX60, reviewed in HCC #131. My only problem with that screen was it just wasn't big enough, as the arrival of Sky HD has made me unapologetically greedy for ever larger displays. Panasonic is currently running two ranges of flatscreens, denoted by the X600 and X60 suffixes. So what differentiates the 50PX600 from Panny's lower PX60 models? Quite a bit actually. Most obvious is the addition of a front-mounted SD card slot for playing and recording JPEGs and MPEG4 movies. It allows users to record TV programmes onto an SD card for viewing later on an SD-based portable media device. The 50PX600's second key attraction is its newly-developed 'Advanced Smart Sound Speaker' system, incorporating a ultra-slim speaker unit (16mm wide by 10mm thick) and twin passive radiator woofers, designed to deliver superior bass, and greater power and clarity. I must say I slightly prefer the looks of the PX600 range. They extend the black screen frame further than the PX60s, and in doing so look less plasticky. Well connected Connectivity is outstanding. Pluggery includes twin HDMIs, three Scarts, dedicated component video inputs, a PC jack, the aforementioned SD card slot, and a CI slot for adding subscription TV services to the built-in digital Freeview tuner. I should add, too, that the HDMIs carry HDAVI: the two-way communication and control protocol that allows the 50PX600 and attached HDAVI-compatible Panasonic gear, such as the company's new DIGA DVD recorders, to be controlled as one. The 50PX600's on-paper specs certainly make for very impressive reading. The native resolution,1366 x 768, ensures that it is HD Ready; its claimed contrast ratio is a frankly incredulous 10000:1; the use of 11.5-bit video processing reportedly helps it dish up a total of 29 billion potential colours. As with the PX60 range, the 50PX600 is equipped with Panasonic's latest picture-processing engine, dubbed V-Real. Among this system's techno talents are native processing of 720p and 1080i HD signals; digital remastering to upconvert standard-definition pictures to give them more detail; gamma control processing, which reputedly delivers 3,072 gradation steps; and a sub-pixel controller that processes the red, green and blue colours separately in each pixel to make lines sharper. 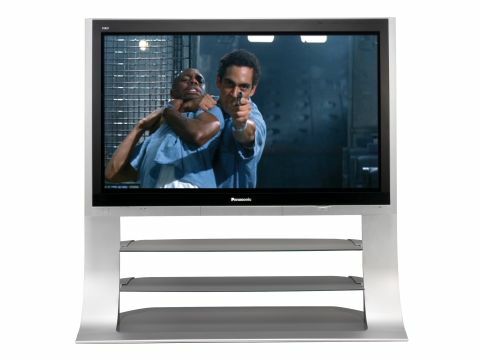 Performance Panasonic is currently the world leader in plasma screens, so you would expect this product to set standards. In many ways, it does. I used a variety of high- and standard-def material to assess its picture performance, and was wowed on nearly all counts. Definition and image smoothness are terrific. The HD coverage of the World Cup in particular provided plenty of opportunities to dissect image quality Matches delivered via the BBC's HD service on Sky, for instance, created exactly the sort of 'as if you were in the stadium' clarity, sharpness and noiselessness that I know HD was invented to deliver. Of course, many good fl at TVs now deliver the sharpness and noiseless clarity of HD. But the Panasonic also dazzles with motion handling, as the players charge around the pitch with barely a trace of blurring. If you're a sports fan you owe it to yourself to see HD football on this screen. There was no trace of colour banding or pixel noise to disconnect me from the emotional impact of the images. The 50PX600's performance with HD movies is arguably even better than it is with HD sport - especially as movies tend to highlight the TV's remarkable black level. For my money Panasonic's Real Black Drive system continues to deliver the most profound blacks in the entire flatpanel world - an achievement made all the more remarkable by the retention within dark areas of terrific amounts of subtle shadow detailing and greyscale shifts. I was also impressed by the stability of the 50PX600's picture (no overt dot crawl or edge shimmer) and a colour tone that, once calibrated, looked totally natural, even with tricky skin tones. The 50PX600 doesn't only look good with high-definition. Standard-def DVDs, and even low-bitrate digital broadcasts, look pleasing on the large screen. Overall then, the screen is a remarkable performer. However, there are some caveats. Positioned alongside some large-screen rivals, both LCD and plasma, its images can appear to lack detail. The resolution of Panasonic's glass will increasingly become an issue for high-end buyers. It needs to roll-out 1920 x 1080 glass sooner rather than latter. Hitachi is moving ahead of Panasonic in this market when it comes to 42in panels and Pioneer is a generation ahead when it comes to 50in models. I'm also not totally convinced by the company's proprietary V-Real image processing system. It just doesn't do as profound a job of adding detail to standard-definition as rival technologies like Philips Pixel Plus or JVC's DIST, but I guess V-Real also generates less unwanted processing side-effects than its rivals. The 50PX600's revamped speaker system delivers an audio performance that's more than functional. Volume can be achieved without cabinet rattle or speaker distortion, the soundstage goes wide and while vocals are rich and rounded.